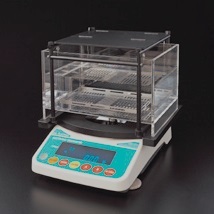 Wide measuring capacity enables to measure the samples without cutting, and calculates an average density for the whole sample. Sensor & water tank size can be customized depending on the sample size. Easy and convenient "auto-weighing function" as a standard feature. Larger samples that could not fit in previous models, with weight up to 3kg can now be measured. Minimum resolution of 0.01g/cm3 and reference value of 0.001g/cm3 can be displayed. New function for powder density substituted measurement. Density resolution 0.01g/cm3 and reference value of 0.001g/cm3.